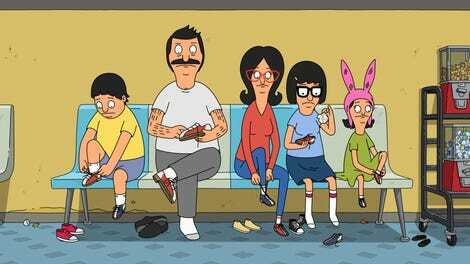 Bob’s Burgers has often returned to the concept of the simplicity of a Bob Belcher burger. Sure, there may be witty names on the chalkboard, but it’s mostly about a well-seasoned piece of meat between two pieces of bread. Times have changed for the art of the burger joint, and Bob is understandably frustrated when his place isn’t considered trendy enough for a feature on “Best Burgers on the Shore,” mostly because of his understandable aversion to sweet potato fries. Change with the times or risk losing business? “Long Time Listener, First Time Bob” explores our favorite burger flipper’s old-fashioned integrity by reflecting it in a deejay who has been reduced to working at a bowling alley because he wouldn’t conform to a changing market. Prizes? Nope. Radio-friendly songs? Not in his timeslot. Nick Offerman returns to Bob’s Burgers for his best part to date, a role that reflects the no-frills persona he refined on Parks and Recreation. One could easily envision Ron Swanson listening to Clem Clemens while cooking a burger, which he will eat with regular fries, of course. He’s not an animal. "Long Time Listener, First Time Bob"
Clem used to work at WIXU, but he was replaced by an automated deejay when it became The Tude, one of those awful stations driven by an algorithm to play only hits with no personality behind them. Given how much Clem once inspired Bob with his “no BS” mantra, Bob takes the chance encounter at Spare Change Lanes as a sign to stick to his guns regarding the art of the french fry. There will be no sweet potato fries at Bob’s Burgers. He will not let his place become The Tude of burger joints. But Bob isn’t done with Clem. He wants to help him get his mojo back too, marching down to the station with Clem and the kids to convince the program manager to give the old dog another chance. It doesn’t go well, and we don’t even get to hear Bob’s speech! Or song! A brief jaunt down memory lane turns into a crisis when Clem blocks the door to the studio, kicking the automated Eddie Tude off the air and making his comeback. He even gives Bob credit for inspiring him to be there, and lets the kids on the air for the dozen or so people listening. 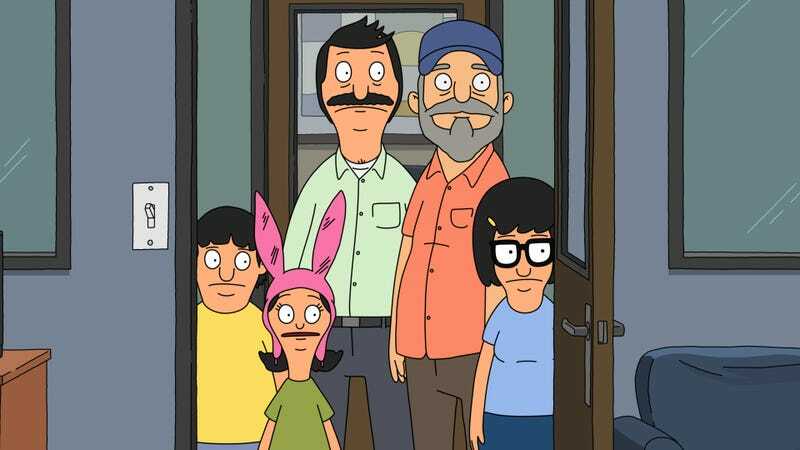 You have to love how instantly the Belcher children reflect their personalities as Gene references his golden ding-dong, Tina gets shy, and Louise gets imaginative. While the kids are having fun, Bob knows this is a problem (and poor producer Patrick is caught in the middle). In between laser sounds and sad trombone noises, Bob tries to talk Clem out of it as Vance the program manager pounds on the door. Meanwhile, after turning all the sweet potatoes into sugarless and cinnamon-less sweet potato pie (which sounds just awful), Linda races down to the station with Teddy, hysterically shouting at Bob’s voice on the radio as if he can hear him. I loved the joke about Linda and Teddy continuing to eat the pies even though they make them gag. The whipped cream helps. As Linda and Teddy head down there, the program manager and guard get in. It appears to be over, but Patrick gets fired and happens to have a key to the Tude Cruiser. Let’s try it again! Clem, Patrick, and 4/5ths of the Belchers park the Cruiser in front of a trendy burger restaurant and start to broadcast. Linda gets through on Bob’s phone and drives home the real theme of “Long Time Listener, First Time Bob,” one that the show has returned to again and again. “The people who like you really like you,” she says. It doesn’t matter that Bob’s Burgers is regularly empty. Teddy is there every day. Sometimes Mort shows up. And the kids wouldn’t want to be anywhere else. Bob doesn’t need sweet potato fries or trendy listicles to be happy. And Clem doesn’t need a big platform. He starts getting calls after the Cruiser is taken off the air. Some people liked it. It’s the optimism of Bob’s Burgers reflected yet again, this time in the line “It’s nice to be appreciated.” The sitcom plotline about an old-fashioned curmudgeon who learns that life has passed him by is as old as the live studio audience, but Bob’s Burgers handles it just a bit differently, highlighting that integrity need not be ignored as long as you’re happy doing what you do and you make a few other people happy too. It’s refreshingly lacking in cynicism and yet never feels sentimental either. It’s almost sweet. Do you think they just have Rob Huebel on speed dial? This was his eighth time voicing a different character. He’s always a welcome voice in a supporting role. It’s fun to try and pick out the photos in the radio station that could be Howard Stern or that could be a Ramone. You have to love Bob singing “Regular Fries” to the tune of Nick Lowe’s “Cruel to Be Kind,” blending the two plotlines yet again by turning classic rock into a song about fast food. Even the credits on this show are smarter than the rest.